In 1972, Linda Jenness ran for President of the United States although she was only 31 at the time. In 1954, Richard Fulton won election to the Tennessee Senate. Shortly after being sworn in, Fulton was ousted from office because he was only 27 years old at the time. The Tennessee State Constitution required that senators be at least 30. Rather than hold a new election, the previous incumbent, Clifford Allen, was allowed to resume his office for another term. Fulton went on to win the next State Senate election in 1956 and was later elected to the US House of Representatives where he served for 10 years. In South Carolina, two Senators aged 24 were elected, but too young according to the State Constitution, Mike Laughlin in 1969 and Bryan Dorn (later a US Congressman) in 1941. They were seated anyway. On several occasions, the Socialist Workers Party (USA) has nominated candidates too young to qualify for the offices they were running for. 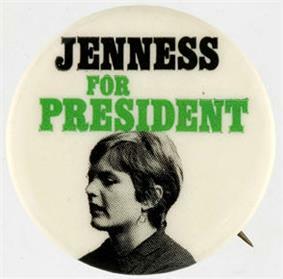 In 1972, Linda Jenness ran as the SWP presidential candidate, although she was only 31 at the time. Since the U.S. Constitution requires that the President and Vice President be at least 35 years old, Jenness was not able to receive ballot access in several states in which she otherwise qualified. Despite this handicap, Jenness still received 83,380 votes. In 2004, the SWP nominated Arrin Hawkins as the party's vice-presidential candidate, although she was only 28 at the time. Hawkins was also unable to receive ballot access in several states due to her age. In the United States, many groups have attempted to lower age of candidacy requirements in various states. In 1994, South Dakota voters rejected a ballot measure that would have lowered the age requirements to serve as a State Senator or State Representative from 25 to 18. In 1998, however, they approved a similar ballot measure that reduced the age requirements for those offices from 25 to 21. In 2002, Oregon voters rejected a ballot measure that would have reduced the age requirement to serve as a State Representative from 21 to 18. In Australia, any person 18 years of age or older may stand for election to public office at federal, state or local government level. The youngest ever member of the House of Representatives was 20-year-old Wyatt Roy elected in the 2010 federal election after the Electoral Act 1918 was amended to reduce the age of candidacy for that office from 21 to 18. In Austria, a person must be 18 years of age or older to stand in elections to the European Parliament or National Council. The Diets of regional Länder are able to set a minimum age lower than 18 for candidacy in elections to the Diet itself as well as to municipal councils in the Land. In presidential elections the candidacy age is 35. In Canada, any person 18 years of age or older may stand for election to public office. However, to be appointed to the Senate, one must be at least 30 years of age, must possess land worth at least $4,000 in the province for which he or she is appointed, and must own real and personal property worth at least $4,000, above his or her debts and liabilities. These restrictions were most recently enforced in 1997. In Estonia, any citizen 18 years of age or older can be elected in local elections, and 21 years or older in parliamentary elections. Minimum age for the President of Estonia is 40. In France, any citizen 18 years of age or older can be elected to the lower house of Parliament, and 24 years or older for the Senate. Minimum age for the President of France is 18. In Germany, any citizen 18 years of age or older can be elected in national, regional or local elections. The only exception is the Landtag election in Hesse where a minimum age of 21 is required. Minimum age for the President of Germany is 40 by constitution. In Israel one must be at least 21 to become a member of the Knesset (Basic Law: The Knesset section 6(a)) or a municipality. In Italy a person must be at least 50 to be President of the Republic, 40 to be a Senator, or 25 to be a Deputy, as specified in the 1947 Constitution of Italy. 18 years of age is sufficient, however, to be elected member of the Council of Regions, Provinces, and Municipalities (Communes). The 1937 Constitution of Ireland requires the President to be at least 35 and members of the Oireachtas (legislature) to be 21. Members of the European Parliament for Ireland must also be 21. Members of local authorities must be 18, reduced from 21 in 1973. The 1922–37 Constitution of the Irish Free State required TDs (members of the Dáil, lower house) to be 21, whereas Senators had to be 35 (reduced to 30 in 1928). The Thirty-fifth Amendment of the Constitution (Age of Eligibility for Election to the Office of President) Bill 2015 proposes to lower the presidential age limit to 21. However, this proposal was rejected by 73% of the voters. In Malaysia, any citizen 21 years of age or older can become a candidate and be elected to the Dewan Rakyat and Dewan Undangan Negeri. Minimum age for the Senator is 30. As of 2015, Malaysia is not considering lowering the age of candidancy to 18. However, since 2015, any citizen not less than 18 years of age and not older than 30 years of age can become a candidate and be elected to the Youth Parliament of Malaysia. In Mexico a person must be at least 35 to be President, 25 to be a Senator, or 21 to be a Congressional Deputy, as specified in the 1917 Constitution of Mexico. In Nigeria, a person must be at least 40 years of age to be elected President or Vice President, 35 to be a Senator or State Governor, and 30 to be a Representative in parliament. In Norway, any adult 18 years of age or older can become a candidate and be elected in any public election. Mette Hanekamhaug was elected to the national parliament at 22 years of age in 2009. In Turkey, a person must be at least 40 to be President. The age of candidacy for the Premiership is the same as the age for parliamentary eligibility. In 2006, a proposal was submitted by the ruling Justice and Development Party to reduce the age for parliamentary eligibility from 30 to 25. The Parliament approved the proposal on October 2006. As of 2012, Turkey is considering lowering the age of candidacy to 18. In the UK (other than in Scotland) a person must be aged 18 or over (16 in Scotland) to stand in elections to all parliaments, assemblies, and councils at the European, UK, devolved, or local level. This age requirement also applies in elections to any individual elective public office; the main example is that of an elected mayor, whether of London or a local authority. There are no higher age requirements for particular positions in public office. 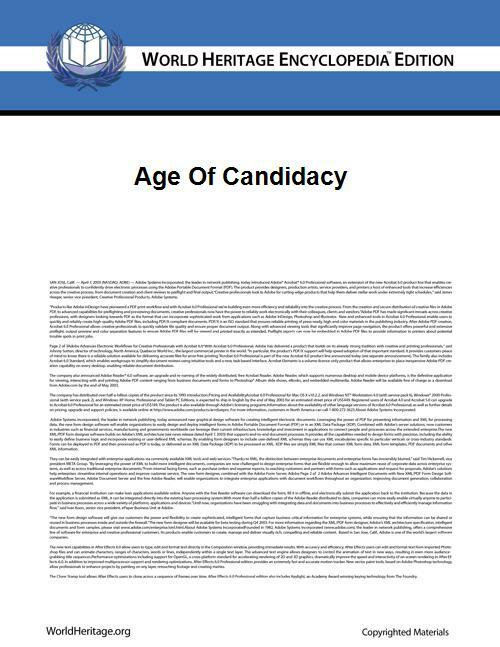 Candidates are required to be aged 18 on both the day of nomination and the day of the poll. This was reduced from 21 by the Electoral Administration Act 2006. In the United States, a person must be at least 35 to be President or Vice President, 30 to be a Senator, or 25 to be a Representative, as specified in the U.S. Constitution. Most states in the U.S. also have age requirements for the offices of Governor, State Senator, and State Representative. Some states have a minimum age requirement to hold any elected office (usually 21 or 18). In Venezuela, a person must be at least 30 to be President or Vice President, 21 to be a deputy for the National Assembly  and 25 to be the Governor of a state. ^ "BYC Youth Manifesto" (PDF). British Youth Council. 2008. Retrieved 2008-07-28. Young people believe that the age to stand as candidates for local, regional, national and European elections should be 16, as should the age to become a trustee of a charity. Young people have significant responsibilities to society at the age of 16 and can have significant responsibilities in the private sector as company directors; this inconsistency should be rectified. Young people have lots to offer and the decision of their appointment to positions of political authority or governance of organisations should be in the hands of the electorate or membership respectfully. ^ O'Brian, Jack (11 January 1969). "Senate To Have Ineligible Man". Spartanburg Herald (Spartanburg, SC). Retrieved 15 January 2015. ^ Bundes-Verfassungsgesetz - Federal Constitutional Law 1920, 1929 version. Retrieved on 3 February 2007. ^ a b c "Children and rights in Ireland". p. Elections. Retrieved 8 May 2015. ^ "European Parliament Elections Act, 1997, Section 11". ^ "Electoral (Amendment) Act, 1973, Section 4". ^ "Constitution of the Irish Free State (Saorstát Eireann) Act, 1922, Schedule 1". ^ Constitution of the Irish Free State, Article 31; "Constitution (Amendment No. 8) Act, 1928, Section 1".